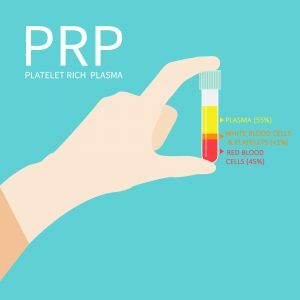 Am I Getting The Best Possible Platelet Rich Plasma (PRP) Therapy? Platelet Rich Plasma (PRP) Therapy has become a popular treatment for many different medical problems. In the last 10 years I have seen Platelet Rich Plasma (PRP) Therapy used for osteoarthritis of the knees, soft tissue injuries, collagen growth in cosmetic procedures, bone growth in dental procedures, hair regrowth and other regenerative procedures. Intense research has been ongoing for over a decade in this country and abroad. However, after reviewing literally hundreds of research articles, what has become obvious to me is that not all Platelet Rich Plasma (PRP) Therapy is the same. The process of performing Platelet Rich Plasma (PRP) Therapy is actually very simple. A sample of blood is removed from the arm, just like any blood test. The tube of blood is then spun in a centrifuge and the blood separates in different layers, one of which contains the platelet blood cells, around which are many different types of growth factors. When this layer is then injected into the area to be treated, these growth factors stimulate new cell growth. So what makes Platelet Rich Plasma (PRP) Therapy treatments different? Why aren’t they all the same? There are so many variables, which can interfere with the final outcome and prevent new cell growth. For instance, there are many different brands of Platelet Rich Plasma (PRP) Therapy kits, all of which have different abilities to obtain the correct number of platelets needed for cell growth. There are also many different treatment protocols; in other words, how many treatments are needed and how often? The training and experience of the medical professionals performing the Platelet Rich Plasma (PRP) Therapy is extremely variable. So how do you know if you are getting the best possible Platelet Rich Plasma (PRP) Therapy treatment? Honestly, it can be very difficult for consumers to know. At Medi Tresse, because we are a medical practice and not just a med-spa, we utilize the most effective methods of performing Platelet Rich Plasma (PRP) Therapy for hair regrowth. We are staffed by physicians, nurse practitioners, and nurses who have done the research and attend annual conferences on hair loss to collaborate with other industry leaders to make sure that we are following best industry practices. Our staff has completed over 1800 Platelet Rich Plasma (PRP) Therapy procedures, resulting in more than an 85% success rate. We monitor treatment carefully with follow-up exams and photos to document progress. We are constantly reviewing and updating our treatment plans for all our patients. Hair loss in women can be an emotional problem and difficult to treat properly. At Medi Tresse, we treat all our patients with the best medical care available, with compassion and respect.